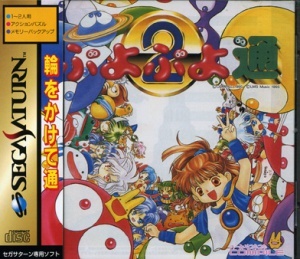 Difference between revisions of "Puyo Puyo 2 (Puyo Puyo Tsuu)"
[[File:Puyopuyo-tsuu-cover.jpg|thumb]]'''''Puyo Puyo 2'''''also known as Puyo Puyo Tsuu, is the sequel to Puyo Puyo, developed by Compile in 1994. The game's title is a pun based on the similarity between the pronunciation of the Kanji tsu (meaning "expert") and the Japanese pronunciation of the English word "two." '''''Puyo Puyo 2'''''also known as Puyo Puyo Tsuu, is the sequel to Puyo Puyo, developed by Compile in 1994. The game's title is a pun based on the similarity between the pronunciation of the Kanji tsu (meaning "expert") and the Japanese pronunciation of the English word "two." Puyo Puyo 2also known as Puyo Puyo Tsuu, is the sequel to Puyo Puyo, developed by Compile in 1994. The game's title is a pun based on the similarity between the pronunciation of the Kanji tsu (meaning "expert") and the Japanese pronunciation of the English word "two." Puyo Puyo 2 (Puyo Puyo Tsuu) on YouTube. This page was last modified on 13 March 2016, at 08:01.